This is not the official website of the Hanauma Bay park, but is simply being maintained as a "fan site" for the amazing place on earth. This web site is for informational purposes only, and is in no way affiliated with the the Hanauma Bay organization or its members. In addition to the turtles, Hanauma Bay snorkelers can take a peek at the Humuhumunukunukuapuaa (the Hawaiian state fish), trumpet fish, angel fish, and many more. Many people mistake coral for rocks or other underwater objects. Actually corals are collections of living entities that reside under the seawater. Hanauma Bay snorkeling is perfect for most ages and fitness levels. 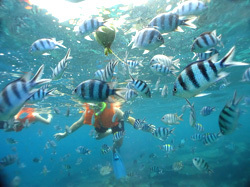 They bay is a great starter area, but is challenging enough for experienced snorkelers as well. You can drive to the bay in your car, or take one of many guided tours. Instead of dealing with the parking, you can also opt to take a bus to the crater and walk in. Snorkeling is the most popular activity on Hanauma Bay. Swimming just above the coral rocks and spotting amazing sea creatures is a relaxing and enjoyable way to spend the day on the island of Oahu. There is at least one company on the beach that rents snorkeling equipment and provides lessons for beginners. Even the most inexperienced snorkeler can have a great time swimming with the Hawaiian wildlife in Hanauma Bay. Hanauma Bay snorkeling is so popular because of the wide variety of species in the bay. In addition to the turtles, snorkelers can take a peek at the Humuhumunukunukuapuaa (the state fish of Hawaii) milletseed butterfly fish, yellow tangs, trumpet fish, angel fish, and many more. 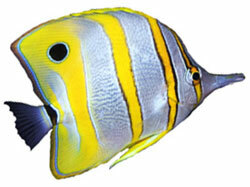 By purchasing an underwater camera, you can take great pictures of the colorful fish and other sea creatures. It will make your trip to Hanauma Bay all the more memorable. Hawaii is a state very committed to protecting its natural wildlife. Since the early 1990s, visits to the Hanauma Bay area have been limited to tourists. The resident Hawaiians are attempting to preserve the area for future generations. As a visitor, you can help with these efforts by obeying all rules for visiting the park. You need to respect the wildlife there and visit without leaving a large impact on the area.